Thank you, Tracy! 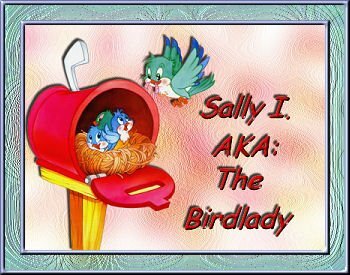 Tracy, a friend in an online crochet group, had read my blog and when practising her Photo Shop Pro 9 lessons, came up with the above adorable tag for me! I am using it here with her permission. So, it's official. You have your crazy catladies, and you have your crazy birdladies. Although I *could* very easily become one of the former, I think I am definitely one of the latter. Guess the two don't mix very well, do they?? I peeked in on the tree swallow's nest this morning. Didn't see any head poking out when I approached, so I got 'up close and personal' , two inches from the hole, and then realized the poor mommy-to-be was sitting in there! Poor thing, last thing I wanted to do was scare her by thrusting my big ugly face into the opening. As for the robin--her eggs should be hatching very soon, if they haven't already. My husband and I were working in the backyard on the weekend, and had a visitor for about a half hour. 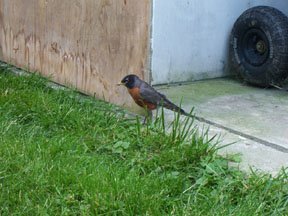 One robin kept hopping around the yard, seemingly unafraid of us. He/she'd get about 4-5 feet from us now and then, and then would hop off to investigate something else. This is him/her by our one shed, I was about 5 feet from him. I guess someone doesn't mind having his picture taken. So...the verdict? Crazy birdlady?? Yup. And a tree-hugger, too!